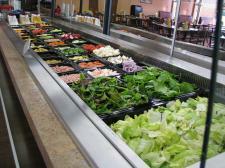 Visit our Soup & Salad Bar, open every day from 11am-2pm. Just $7.49 for all you can eat. Our fried chicken is Chester's Fried Chicken, with its unique blend of herbs and spices. We also have baked chicken. Contact Manager, Felicia Hernandez, and she will try and find it for you.